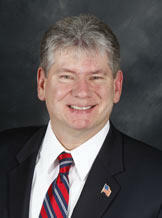 Gary Woronchak is Chairman of the Wayne County Commission. Wayne County Executive Warren Evans says the county's deficit is higher than feared, and if nothing is done, the county is on track to add $70 million each year to the $88 million deficit. But the head of the County Commission, Gary Woronchak, says the county can dig itself out of the hole. Still, he says there are painful decisions ahead. The county's revenues are a third less than needed to pay the bills. And the pension system is 45% underfunded. "We're at a dangerously low level. But the fund is making much better returns now. They've got a financial advisor and the markets have turned around. "Wolonchak says talk of an emergency manager or bankruptcy for the county is "highly premature." He says that kind of fear is understandable, given what just happened to Detroit. But he says Detroit wasn't paying its vendors and Wayne County is. He says the county may need to enter into a consent agreement at some point with the state, but there is political will to solve the county's financial mess in a transparent manner.